Another innocent citizen has disclosed that he was kidnapped and assaulted by Patriotic Front cadres for no apparent reason. 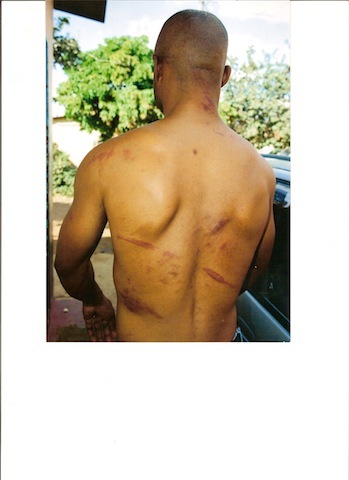 Mr. Liato Biemba Junior has told the Zambian Watchdog that PF thugs on May 17, 2013 trailed him from the Great East Road up to Mtendere Township were they kidnapped him, drove him to the gates of Chainama Hospital before brutally assaulting him, grabbing his Leather Jacket that contained KR6000, a bottle of aftershave and a remote for the car stereo. Mr. Biemba has disclosed that he reported the matter to Mtendere Police Post and a docket was opened against the suspects but nothing has happened. Mr. Biemba named the suspects as Danny a Minibus Driver of Kalikiliki bus station while others are PF cadres Neddy, Barnabas and Mwaba. The only reason Mr Biemba was abducted and beaten is because the PF militia suspect him to be an MMD supporter. Mr. Biemba who availed the photographs to the Zambian Watchdog named the police dealing with the case as Mr. Chabu Mulenga the Criminal Investigations Officer (CIO) for Mtendere Police Post. “ I have told the Police Officers that I know were these people live but the Police officers do not want to pursue the issue, it is very shocking indeed” Mr. Biemba said. Recently PF Secretary General Winter Kabimba challenged MMD President Nevers Mumba to avail names of violent cadres to the Police.